Saturday was wedding day. Jennifer and Brandon made a fabulous couple. The weather was perfect. There was a small rain shower while we were all in the church...just enough to make a rainbow in the distance as we drove to the reception. The Work Girls , as Diane's daughters so charmingly call us, were looking very stylish and many were wearing creations by The FamiLee Jewels. 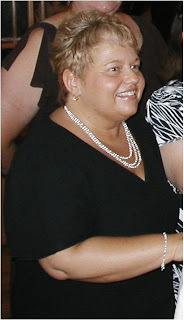 Dianes mother of the bride necklace and earrings looked stunning on her. Actually she looked stunning..... the jewelry went along for the ride. 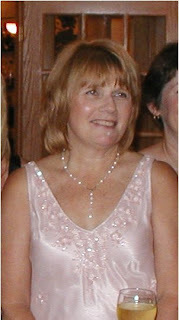 Linda looked classic in her little black dress and swarovski pearl and crystal necklace and bracelet made by Becky. 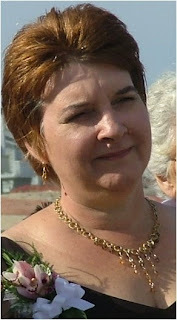 Michelle was trendy in a multicolored pearl necklace that she purchased at a jewelry party. She had asked me to make the earrings to match. wedding so it has nice memories attached. We danced and visited and had a wonderful time, directed by Diane of course "Work girls, get out on the dance floor". Congratulations Jennifer and Brandon. May the rainbow on your wedding day be a wonderful omen for the years to come.